The exterior of your car is what everyone sees; it’s the face of your driving experience. If you want your vehicle to look good, you have to take care of it. Knowing how to properly detail a car is a great skill to have and can even make you a few extra dollars on the side if you wanted. Of course, you could take your car or truck to a professional detailer and spend a couple hundred for someone else to do it. But wouldn’t you rather save most of that money and remove the risk of a shoddy detailer not doing the job right or even damaging your paint? We’ve all heard the horror stories of what can go wrong when you get your oil changed at a random quick lube place. The same can apply with auto detailers. Nobody’s going to care as much about your vehicle as you are. 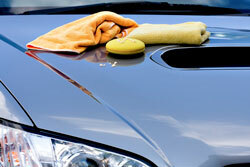 These days, auto detail products are a lot more user-friendly and forgiving. All you need to know are what products you’ll need, how to use them, and a few free hours on a weekend. This guide will help with 2 out 3 of those. If you want to successfully detail your car, the first step is to gather all the supplies that you’ll need to get the job done. 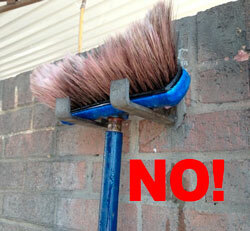 The quality of these products often dictates the safety and effectiveness of your detailing job. Simply buying whatever detailing products are on sale is not a good idea. Pay a little more for high-quality supplies. They usually require less grunt work and the results are more noticeable. You’re not looking for professional grade, but definitely something better than the cheap brands. To make it easier, I’ve listed some of my favorite products below (and I’ve tried A LOT over the years). Feel free to disagree in the comments below but I ask that you also note what YOU feel is the best detailing product for the money. Most experts recommend that you tackle the wheels and tires first because the worst dirt and grime comes from driving through mud, sleet and other bad road conditions, and you don’t want to spread that crud to other areas of your vehicle. That said, it’s perfectly fine to wash your car first and do the wheels after. You just need to remember to keep the exterior wet or you will get water spots before you even fishing washing the wheels and tires. Start by spraying down the entire car with a nozzle hose to remove surface dirt. The nozzle allows you to be gentle on your paint, but you can switch to a stronger spray for the messier wheels and tires. Use a wheel-cleaning solution created specifically for these dirty areas of the vehicle, preferably a nonacid solution that will not damage the color or coating of your wheels. There are many spray-on products available that can be applied, sit briefly, agitate the wheel and tire surfaces, and then be hosed off. You’ll want to work on one wheel at a time. After spraying on the wheel cleaner, you’ll want to let it sit for a minute or so before doing some scrubbing. Most likely, you’ll want to use a wheel brush (with soft bristles that will not scratch) or a dedicated sponge or wash mitt. Don’t even think about using the same wash mitt for both the wheels and paint. 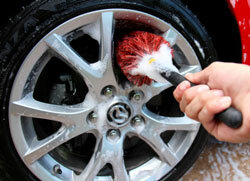 After scrubbing, thoroughly rinse the tire and wheel using a strong water stream. Repeat the process for each wheel. If there is one project you can take on to keep the exterior finish of your car looking great, it’s to wash your vehicle regularly. Of course, the other detailing steps will make it shine even more, but a good wash will remove basic contaminants from your car’s exterior and make future washes and detailing easier. When you have dirt, dead bugs, road materials and other gunk trapped on your car’s exterior, these contaminants can damage your finish. Most auto experts recommend that you clean your car at least once a week, but a better rule of thumb is that you should wash off any obvious problems as soon as you see them to avoid damage and expensive repairs. While you can just take your car to a local car wash, taking the time to go through this process yourself will lead to better results. Just keep in mind that cutting corners, such as using a dirty sponge or a paper towel, can lead to scratches in your car’s paint. If you must, it’s ok to use a full-serve car wash every now and then especially if you live in rainy or snowy climates. Try to avoid the car washes that are run by gas stations since they’re not cleaned and maintained as well as dedicated car wash businesses. Keep in mind that it’s just not possible to clean every nook and cranny of your vehicle’s exterior in full service wash. Skip any of the worthless add-ons such as polish/wax, undersealant, deluxe wheel cleaning, etc. Whatever you do, NEVER use a self-serve car wash. Most of them have a single brush that people use for paint, wheels, and even their engines. Doing so will almost guarantee you scratching your paint. Even if it doesn’t happen the first time you do it, it will at some future visit. Don’t try to wash your car right after it’s been running or in the middle of a hot day. Instead, wait until the surface is cool and less likely to become damaged. I prefer washing a car in the morning or early evening. If you plan on following with claying and waxing, start in the morning to make sure you have good lighting until you’re done. Set up a two-bucket system: one with the car wash soap and water and the other with plain water. Thoroughly rinse your vehicle’s surface to remove any loose dirt, grime, and bird droppings. 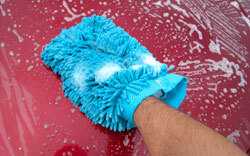 Dip your wash mitt into the soapy water, and starting at the top of your car, apply it generously to the car’s exterior in small wash areas. You’ll want to frequently rinse out the mitt in the 2nd bucket and load up with more sudsy water in the 1st bucket. Once a section is done (ie: roof, hood, etc. ), you’ll want to rinse off all the soap before starting on the next section. Again, work your way from top to bottom since the bottom is usually the dirtiest part and you want to lessen your chances of trapping that dirt in your wash mitt and using it to scratch the upper sections of your vehicle. It takes more time with the two-bucket system, but rinsing off the grime before you return the sponge to the soap keeps the soap bucket clean and prevents you from rubbing dirt back onto your car’s exterior. Once you’ve washed and rinsed the last section of your vehicle, use a clean microfiber towel to completely dry all surface areas. The microfiber is gentle on the paint and very absorbent. Again, start at the top of the vehicle and work your way down. 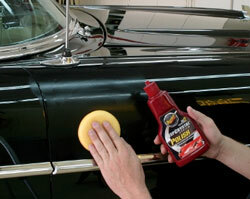 Auto detailing clay is an engineered resin that can aid in removing surface contaminants. Because it’s safe and nonabrasive when used correctly, claying your vehicle once or twice a year is one of the best things you can do for your car’s exterior. The most important rule when using a clay bar is that the surface must be properly lubricated. Clay bars are usually sold as kits these days and a bottle of spray lubricant is included. To start, make sure your car is in a shaded area. Take a small piece of the clay bar (I like to divide a new bar into 3-4 pieces) and flatten it between your hands. This makes it easier to work with and since you need to throw away the clay if it’s dropped on the ground, you won’t waste an entire bar if that happens. Working in small 2 x 2 foot sections, spray the lubricant on the car’s exterior. Using very light pressure, rub the clay bar along the surface in a straight line back and forth. Doing so will allow the clay to pick up direct and contaminants embedded in the car’s paint. Add more lubricant if you feel the clay “catching”. When you can glide the bar freely against the exterior, that section is clean. After each section, take the clay bar and slightly knead it so you have a clean surface to work with. Keep in mind that claying will actually leave tiny holes in the paint where the contaminants have been removed. Therefore, you must always follow claying with waxing to protect the exterior. Don’t forget to clay the windows! Sounds silly but works great. If your vehicle has swirl marks, light scratches, stains from bird droppings, or the paint is oxidized or dull looking, washing, claying, or waxing will not fix this. You’re going to need to get a bit more aggressive. While professionals will use a power car polisher or buffer to get this done quickly, it’s not something I would recommend without at least some experience. You can easily burn right through the layer of paint, especially on corners and edges where the paint layer is the thinnest. There are various types of polishes, compounds, and glazes. 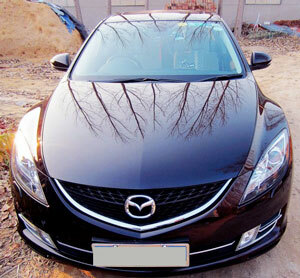 Vehicles with only very minor scratches or swirl marks only need a very mild polish. Those with more noticeable scratches or oxidization will require a more aggressive compound. See section 1 above for the products I recommend. Similar to claying, you’ll be working in small 2 x 2 foot sections. Take a clean applicator pad and apply about a quarter-sized amount of polish to the center of the pad. Using a firm amount of pressure, apply the polish to the car’s exterior either in a straight back and forth motion where you change the angle of the motion halfway through. Once the section dries to a haze (should only take a couple minutes), take a clean microfiber towel and buff off the remaining polish on the section. Turn over the towel frequently so you don’t just spread around the dried polish. If you still see scratches but can’t feel them, repeat polishing that section if you wish. Otherwise, start on the next section. So now you’ve cleaned the dirt off the surface of your car (wash), removed contaminants that were embedded in your paint (clay), and smoothed out the paint (polish). The last step is to protect the surface of your car. A car wax will do just. Think of wax as a sacrificial layer on top of the clear coat. For instance, bird droppings contain acid which can be corrosive enough to cause permanent etching and staining on the clear coat or even the paint layer. With a layer of wax to go through, it’s much less likely for any damage to be done. Same goes for dirt that’s on your car. When you rub it to clean, the dirt which is essentially super tiny rocks, can easily scratch the clear coat or paint surface. Again, with a wax layer, it’s there as an extra layer of protection. You’ll also notice that after waxing, your vehicle will be much easier to wash for up to a few months. I prefer to wax my car a couple times a year. Some car enthusiasts I know do it four times each year. The process is very similar to polishing although much easier since you’re simply applying it to the surface instead of using it as an abrasive. Take a new applicator pad and put a small amount of wax in the middle (a little goes a long way). Working in about a 2 x 4 foot section (I like to start at the top), apply the wax using very light pressure in a back and forth motion and change the angle about half way through. A circular motion a la Karate Kid “wax on, wax off” style is not recommended for either polishing or waxing. It’s much more likely to get noticeable swirl marks this way. Once the wax is applied, it needs to dry to a haze, after which you can remove the residue by buffing (some waxes don’t require it to haze so read the manufacturer’s instructions). Once you’re done applying the wax to a section and it has hazed over, take a clean microfiber towel and buff off the residue surface wax until the surface is smooth and shiny. You’ll want to frequently be flipping the towel over so you’re not simply rubbing the wax residue back on. Continue waxing the remaining sections of the car including the windows, mirrors, headlights, wheels, and even your license plates. This just makes everything easier to wash in the future and the wax acts as a natural water repellent working even better than a product like RainX. Tip: After waxing, you will undoubtedly have leftover wax residue in cracks and creases your microfiber towel can’t get to. To remove, simply use a standard pink eraser to rub it out or use an old toothbrush for really hard to reach spots. 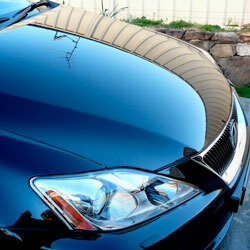 Keeping your car looking its best is easy with these steps to properly detail your car’s exterior. Not only will you save money by not taking it to a professional detailer, you’ll also get this amazing sense of accomplishment by doing it yourself.